One of the major things recommended to anyone in digital forensics, and probably network or systems administration as well, is to build a lab in which to test tools, techniques, theories, or anything else one might come up with or across in day-to-day work or personal research. 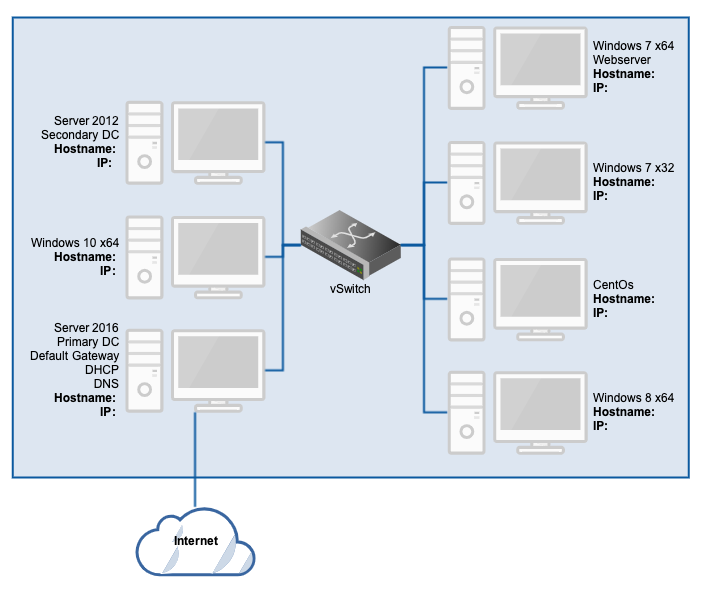 Herein lies part one of a guide on building a very simple lab in a cloud environment. If you’ve not used a VPS provider like Vultr (or Amazon, Azure, Digital Ocean, etc. ), read this post first to become familiar with the general process of creating a VM. The vSwitch will be handled by the provider, which should allow for private IP addressing on an internal NIC for each VM (meaning each VM will likely have two NICs; one public and one private). All public facing NICs except that belonging to the DC will be disabled. Ordinarily, it’s inadvisable to dual-home a DC and make it the default gateway for a network, but it’s a quick and dirty way to have a single point of access for the lab. Alternatively, a separate VM could be used to share Internet to the internal network, but why add another device unnecessarily? We’ll begin with the configuration of the primary domain controller (DC) for the domain; a Windows Server 2016 VM. Most Windows ISOs can be found in the Microsoft Evaluation Centre: https://www.microsoft.com/en-us/evalcenter/. A benefit (and disadvantage) of building a lab this way is that you’re basically required to break it down and rebuild it every six months (when the OS evaluations expire). NB: I’ve learned from many frustrating attempts that creating a Server 2016 machine with anything less than 2048MB of RAM is a poor choice. Don’t do that. It may work, but crushingly slowly. Ideally, spring for at least 4096MB of RAM. Once the installations are complete, feel free to click Close. Complete the wizard by accepting all remaining defaults, then click Install (don’t mind any warnings about DNS and DHCP, they’ll be taken care of later in the process). Once rebooted, the VM should be joined to the newly created domain, and logging in is achieved with <domain>\Administrator credentials instead of <computername>\Administrator. The next page pertains to WINS servers, which won’t be used in this environment, so accept defaults and click Next. Select Yes, I want to activate this scope now and click Next, then click Finish. Success! The DHCP server component of the primary DC has now been successfully configured! Next we should configure the server’s static private IP. Each cloud provider has instructions on the correct settings for a private network adapter, best to follow those guidelines where possible. For example, the default gateway above is the IP address of the public facing NIC of the VM, and the alternate DNS was supplied by the cloud provider. Yours will likely be different. Click OK, then Close. Done. In the wizard, accept defaults until asked for a zone name. Enter a name which matches your domain (in my case, the domain name was cherrypie.corp, so that’s what should be entered as the zone name). Accept defaults till the end, click Finish and the new primary zone should be created. With the DC effectively acting as a router in order to provide Internet to the private lab network, it needs to have the Remote Access role installed and correctly configured, otherwise there will be weird routing issues internally which present as VMs being able to resolve Internet domain names via ping, but unable to receive ICMP responses. Accept the feature prerequisites as necessary, click Next, Next, then Install. NB: If no network adapters show up on the next page, make sure IPv6 is enabled on both NICs and try again. This completes the NAT configuration. Further lab machines should now be able to connect through this VM to the Internet. One last thing before signing off on this VM, we should create some users in AD. Now we have a fully functional DC, and what should also be a working DHCP and DNS server, plus an everyday domain user, and a named administrative account which can be used to add the other machines to the domain as they are created. Most of this configuration could be automated, either by using a Sysprep image to roll out images over the network or by using command prompt or PowerShell. However, I think there’s value in following a manual process from time to time, if for no other reason than to stay up to date on the process of administering systems. It also allows the analyst to gain a better understanding of the systems with which they will be working. One thing which hasn’t been covered in this write-up is how to harden a system, whether it’s a server or a workstation. This has been intentionally overlooked; if this is a lab environment designed for testing, it’s best to leave it at least somewhat default, otherwise it’s not a realistic place for testing. This lab is designed primarily for blue team testing, because any penetration testing of systems one does not own requires explicit written permission from the network owner. If you plan to perform red team testing in your cloud lab, get written permission from the cloud provider before starting. Also get an understanding of local, state, and/or federal laws in your area. There’s a lot that could be done with the Windows firewall, built-in or third-party antivirus and antimalware, or even purposefully installing vulnerable applications in order to test specific attack methods. Alternatively, a third-party firewall, such as pfsense, could be spun up to make this lab network less vulnerable. This is something that can be looked at in the future, and maybe I’ll produce something on it a little way down the line. If you followed along to this point, good job! Feel free to let me know if there are any glaring omissions, or if there’s anything which needs further clarification or explanation. Go here to see how to continue the build with a Server 2012 R2 server as the secondary DC for the domain.